Adjective or adverb or a little of both? This should be too easy. ‘The home team pressed stronger towards the final siren’. The above sentence would not be considered formal English because of its adjective-adverb confusion. Formal English demands that we use ‘more strongly’ instead. Or should we? When a metaphor is confusing (‘pressed towards a siren’) the application of parts of speech will also become confused. It might be better to recast the sentence in less ambiguous terms. Too easy. 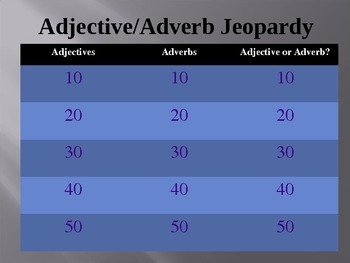 Adjectives modify nouns, while adverbs do likewise for verbs. Yes, it should be that simple. But it isn’t. Why? Because of the following words, all beginning with ‘a’? Are they adjectives or adverbs? And what about sentence adverbs? They take adverbial form but they don’t just modify the verb; they modify the whole sentence. So hopefully (he said hopefully) the sentence adverb and the problem adverb can continue to coexist with the orthodox adverbs and adjectives in grammatical harmony. Nice hope, though I have my doubts. It has done well, though perhaps not good, to survive this long. Setting aside the multicultural origins of English, do we not all practise bilingualism every day? In the workplace we have a huge variety of language choices, from our formal presentations to our private chat, from our social dialogue to delivering conference papers or giving court testimony or conducting job interviews. We do not use the same register of English for these. If we do, we strike a discordant note. People who confuse or violate such language rules can be judged as unprofessional, inappropriate, creepy or unhinged. Change gear: it’s wrong for that hill. At home we use various registers, modes and forms of English when speaking with children, pets, neighbours, traders, hawkers or community authority figures. Within families, our different word choices abound when holding a conversation with infants, toddlers, young children, teenagers, household adults, in-laws, elders, and the very old. And what about our spouses or lovers? Language in the bedroom can be an entirely different communication experience. We do not use the same form of English as we would in a boardroom or in church. The same words for one field of activity are inappropriate and discordant at another. People living in some countries may have to toggle between different language communities, especially if they live and trade in border areas, or they work in trades where a global language like English, Arabic or Spanish is necessary. But even in supposedly monolingual English-speaking socieities we gear-shift varieties of English that often amount to dialects. Anyone who attends a football match knows that we make choices of language when sitting with friends, strangers, fellow supporters or opponents, depending on the personal relationship. This is not language of the bedroom or classroom or conference hall. What about the conversational register used by blokes on a fishing trip or at a buck’s night? What about the rarefied language choices we reserve for church or prayer, weddings or christenings or funerals? How about our language choices for use in forums, when giving a public address or asking questions from the audience? What choices might we then make with our technical or Latin phrases, or foreign word pronunciations? Compare the language choices made by old friends meeting again after a long interval with the language of people meeting for the first time: the differences possibly magnified by time spent with other language communities or in disparate occupational groups or with association by people of the same sexual orientation or with a hobby in common or from different religious communities? What about the language choices we make when speaking with old flames, former lovers or ex-spouses? A ‘wrong’ word choice can cause old wounds to inflame. We step around a minefield of synonyms, reaching for our mental thesaurus to avoid giving offence or causing confrontation. What about the language of our present social lives? What word selections do we make in the process of forming or maturing Platonic relationships, or seduction, or harmless flirtation or the language of aggressive behaviour or social manipulation? What about the way we express ourselves to others when we’re playing sport? What about the word choices we use when communicating with others while engaged in the arts, such as attending a play, a gallery, a book launch or a concert? Language used by diners in a posh restaurant is not the same as the form of English spoken in a public bar or on a bus or at a school basketball game or in a committee room. When context and setting change, so do our language options. We hear a different variety of English in hospitals and police stations. Builders use one aspect of the language that is different from the hairdresser, the masseur, the priest or the teacher. And as when we move around, the language of travel changes too. Strangers on a train or a plane or a plain may each speak English but they converse in different ways. We choose words, feeling our way, unsure of our relationships. When we queue, we may converse differently with those around us, depending on mood and circumstance, and perhaps the length of time we are kept waiting. When we negotiate, haggle or bargain with traders and street gipsies, we employ certain word choices at variance with other environmental conditions for talk. And all of the above relates to spoken language. What about the different levels, registers, varieties and dialects of written English? When we write an essay for publication it’s not an identical language to the one we use if writing a menu or project proposal or academic work. There’s the whole gamut of what we may categorise as ‘creative’ writing: poetry, literary fiction, drama or screenplay. But there’s also musical comedy, opera libretti, children’s books, songs, comic verse, stand-up comedy, docu-drama and creative non-fiction. These are all creative and each genre uses different varieties of the English language to convey its messages. As a discrete set of word choices they can hardly be compared with market research, medical records, training manuals, legislation, depositions, advertisements and technical manuals. Nor can any of these be considered as belonging to the same sub-sets of English as dissertations, monographs, newspapers or cartoons. Each requires its own language skills for reading and writing. Change gear, change mode, change the dialect. Business writing and technology journalism require different sets of jargon and specialist language from film or fashion or music or motoring reporting. They each have their own terminology and assumptions. They each require the reader to make adjustments, using esoteric word choices that can make their meaning as incomprehensible to an outsider of that language community as a Swiss is to a Swede. Then there are all the professions with their own vocabularies: medicine, law, science, architecture, engineering, and accounting. There are entire language communities who speak in a patois bordering on dialect: bookmakers, investment brokers, military analysts and economists. Each of these employs a sub-language that requires adjustments of vocabulary and syntax for its different audiences, and for speakers of those languages to exchange information before shifting to other modes of speech and writing. Add to all that the possibility that even if the writer is a native English speaker, he or she may have a colleague, spouse, client or boss who speaks another tongue with its subtle differences reaching into every interpersonal relationship. The risk of Babel syndrome is ever present. This may well be a result of continuous and simultaneous translation across generational or familiar lines. They may be Italian-American, Chinese-Australian, Pakistani-British. Or they may work in IT.